The number of Azerbaijan’s population continues to grow very fast. As for February 1, 2017, the population of Azerbaijan reached 9,816,100 people, having increased by 0.1 percent since the beginning of the year. About 12,200 births were registered this January. This indicator features 14.8 births per 1,000 people in the country. Some 53 percent of newborns were boys, while 47 percent were girls. During the first two months of this year, the registry offices recorded 4,300 marriages and 1,100 divorces. 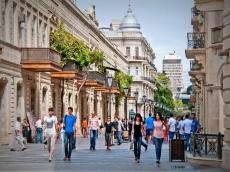 This January, the number of people who came to Azerbaijan for permanent residence made up 146 people and this exceeded the number of those who left the country made up 97. Azerbaijan is among leading European countries in terms of natural population growth, which in turn contributes to the development of economy.